Serial Input options are used to specify communications parameters for a scanner or other device connected to a serial port that will be used to acquire data. In the DataWedge UI, the number of serial ports availabile for selection varies according to the number of serial ports on the host device. Applies only to devices running Android N and higher. Pre-N versions offer Enable/Disable function only. Input enabled on Serial port 1 of a Zebra VC80x; second serial port (disabled) also shown. 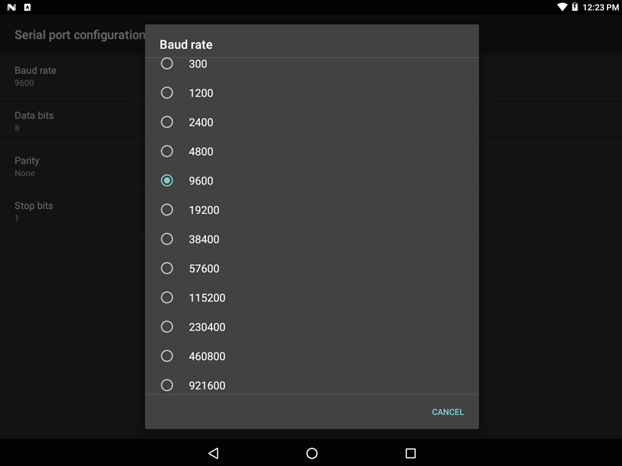 Baud rate - specifies the modulation rate of the connected serial device. Data bits - specifies the number of data bits in a serial frame (data bits per byte). Stop bits - specifies the number of stop bits to use. Tapping on a setting displays a dialog box for changing its value. 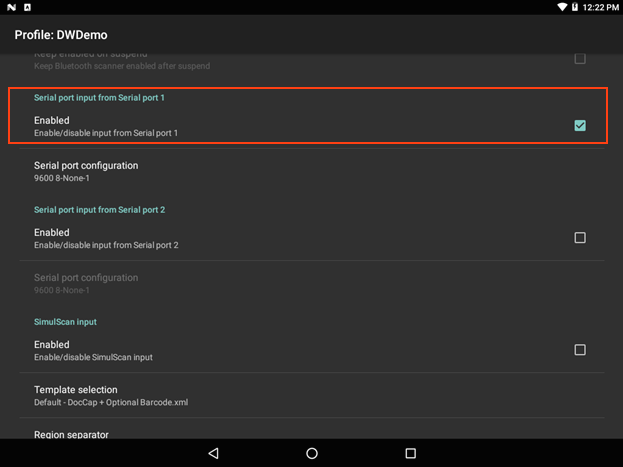 Serial port configuration is available only on devices running Android N and higher. For prior versions, only the Enable/Disable options are available for serial ports. For more information about required serial communication settings of a specific device, please refer to documentation that accompanied the peripheral being connected. Serial-port settings also can be configured programmatically. See SET_CONFIG API section.